"The Gazette" latterly known as "The Gaz" was the in-house magazine and was produced quarterly until 2009. It has now been superseded by the "M.P.P. Users' Club Newsletter" (NL). Generally publication is aimed for January, April, July and October. Content ranges from technical matters to the every day use of M.P.P. products. There are regular features on members' use of equipment. Tips on improving performance and reliability, as well as fitting and using accessories and gadgets made by other firms such as Polaroid and Wray. The use and fitting of unusual lenses to the large format cameras has always been a popular subject. There is considerable interest in the historical aspects of the company that produced so many well engineered British products many of which are still in use every day by professional and amateurs alike. Also much research has been carried out on many subjects, the results of which are published. This continues. The why and wherefore of every detail including seeking new information to update the club's records and archives is always of considerable interest to many readers of the Newsletter. Club members are encouraged to take an active role in obtaining facts and figures in order that they can be published in future editions of the magazine for the benefit of all. The original GAZ magazines from 1995 onwards have been reproduced in the Members' Area . 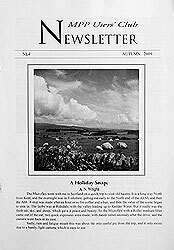 These magazines contain a wealth of articles, advice and photographs all relating to M.P.P. cameras. Very interesting.